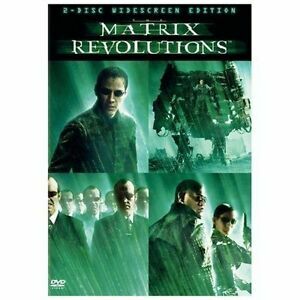 The Matrix Revolutions (2004, DVD) cinematic history! This is, just one of those movies you either love or hate. The Matrix trilogy captured my imagination from the start. After seeing, and purchasing the first two movies in this trilogy I, simply, had to own number three. This movie is certainly an action packed thrill ride and if you liked the first two in the series, "a must see"! I must admit that I was a little disapointed that this particular DVD was "reformated for TV viewing". I prefer the letterbox format much more and the other two DVDs I own are formated that way. I just wasn't thinking about this aspect of the DVD when I purchased it. So, just let me say, always remember to question the aspect ratio of a DVD when you plan to purchase one, weather you like the letterbox format or the reformated to fit your TV screen style. This action packed finale of director Andy Wachowski s trilogy finds an unconscious Neo (Keanu Reeves) trapped in Mobil Avenue, a subway station in an intermediate zone between the Matrix and the machine world that is controlled by the Trainman (Bruce Spence). Trinity (Carrie-Anne Moss) and Morpheus (Laurence Fishburne) try to free Neo so he can lead the fight to save Zion - which is under attack, and very near to destruction. However, a powerful enemy complicates the overall tasks of all. Good fight scenes similar to the Original Matrix movie and this flix moves away from the more romantic episode of the Second movie of the series-The Matrix Reloaded. Overall, this movie ends the trilogy in a very satisfying manner. Violence scenes are graphic for a sci-fi movie, however they are not terribly offending such as you see in present day war movies, etc. A good movie that will more than fill an evenings entertainment for most people. Very good movie, especially if you have seen the first two in the trilogy...shop around as you should be able to find this DVD for about 5$ total (yes, including the S&H). It's better than the 2nd (The Matrix: Reloaded), and right around the same as the first, The Matrix, in terms of the overall quality of the movie, i.e., story line, special effects, and cinematography. The special effects are pretty amazing and the fight sequences are nice. I would recommend watching this using a 5.1 surround system as that will certainly enhance your movie watching pleasure! the 3rd installment of the Matrix trilogy was a dissapointment primarily because of the ending. despite the fact that the whole Matrix "philosophy" (or "religion") was impossible to follow and understand, this last episode disappointed in a major way. obviously a loose story of another "Messiah" with Superman powers, i found the final explanation to be utterly preposterous. at the end Neo is asked by Mr. Smith why he keeps going, despite the fact that life is so full of pain and suffering. Neo's reply is, "Because I choose to." BULL! Hollywood should have had him say, "Because I have no choice" which would have been the fitting and truthful answer to why we all go on in the face of sad and awful reality. we really do go on because wqe are wired from birth to do so. still, the special effects throughout the trilogy are stupendous. It could have been a excellent movie, but they tend to over do the fights, When the machines attacked their place. It was just too much, and too long. What was boring was those special meeting to get information from a cook, or a grandma. Sleep time USA ...Apart for those minor parts it was a good movie. At the end, there was sure that there would be no more Matrix movies made. There was a few un-answered questions were left out. I just hid my sun glasses after this movie. Part 1 and 3 are better. This is number 3.